Jim Edmonds played well enough to earn a spot on the 40-Man roster of the Milwaukee Brewers for 2010 - hopefully his comeback in his age 40 season proves to be successful [hope he doesn't get released in May or suffer some kind of career ending injury] and he finishes his career basically enjoying a season where he plays enough to reach some career milestones [collecting 2,000 hits in his career and hitting 400 home runs. 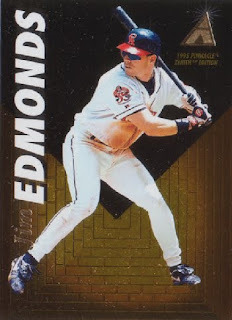 I honestly can't say I followed his playing career as close, when Edmonds really enjoyed his peak seasons in St. Louis - I do pick up his cards when I can just because he came through the California Angels' farm system and established himself as a star when I was paying closer attention to the team. 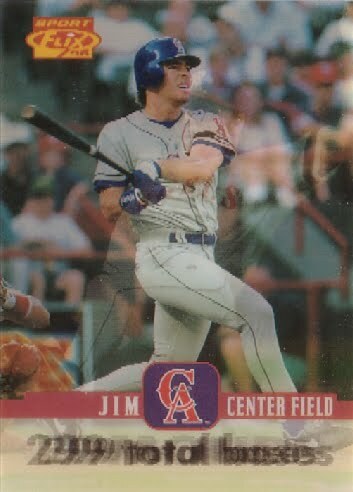 It was Tim Salmon, Edmonds and Garret Anderson who formed one of the best young outfield trios in baseball - for the Anaheim Angels during the late 1990s. I'll assume the patch was cut from a 'game-worn' jersey from the 2006 Futures Game in Pittsburgh - since I cannot immediately associate the colors on the patch card to a Milwaukee Brewers uniform. "The relic contained in this card does not come from specific game, event or season." I picked up the card for $5, which is probably too much, but I realize $5 can't get me an 2009 Upper Deck Ultimate jumbo patch card - and regardless of perceived value of the card, Gallardo is a rising star who is the ace of the Brewers' pitching staff. For my collection, a card with a small patch swatch is OK - I do like the novelty of being able to see a little bit of the jersey from where the patch was cut from. Seeing some separation between the actual patch and jersey material gives a patch card some character. It is disappointing when a patch card only has a one-color patch piece covering the entire window where the 'game-used' jersey / material is visible - the purported patch card becomes like another a plain jersey swatch card. I never really had an opportunity to get Tino Martinez's autograph when he was an active player - since he wasn't exactly an 'easy sign' when he was starring for the New York Yankees through their dynasty years, where the organization won four championships in 1996, 1998, 1999 and 2000. Maybe Martinez signed, 'here and there,' but I never saw him pick up a pen - with my own eyes, particularly when his Yankees' teams played the California / Anaheim Angels. I found the signed 1993 Fleer Ultra card [picturing Martinez as toiling for the Seattle Mariners] in a dollar bin at a card shop - during my spring training trip to the Cactus League. Obviously it is an in-person / through the mail autograph, so the authenticity of the signed card maybe up in the air - but it was probably worth the dollar gamble, since I think the autograph is real. I've only really picked up four retail rack packs of Topps Heritage and this featured card, though looking through the cards I pulled - I'm ambivalent over this year's base cards. The images on the base cards seems washed out to the point of being ideal for a blue Sharpie autograph - but simply being too boring and gloomy [unlike 2009 Topps Heritage, where I thought the images were brighter and the card graphics popped out]. For some reason, I like the card backs featuring a greyback card stock with a dark two-tone green/black colors - it makes me wonder if this was how the original cards were, when they first came out of packs back in 1961. Perhaps not, but there is still a novelty I associate with perusing the backs because there seems to be a lot of things to digest - the text / statistics are simply hard to read, but it fascinates me how Topps manages to lay out the back with so many different things including the card number, the player's name, team, position, bio, a blurb, stats and a cartoon as well. San Francisco Giants Buster Posey is one of the top prospects in baseball and his status as a future star is more important - considering he is a catcher, probably the most demanding position on the field. Just for his catching skills alone, a guy can last 15 seasons in the Major Leagues - Posey is expected to be the next catcher who is a good athlete, but also can hit a ton. Posey ranks near the top of the best prospects in all of baseball - but despite the hype surrounding Posey, the Giants resigned Bengie Molina for one more year. Resigning Molina likely buys one more year in the minors for Posey, but also annoys San Francisco Giants fans. Right now, Posey is looking to find some playing time on the field at first base as he lies in wait - to take a stranglehold on the catcher's position in San Francisco for years to come. 2009 Donruss Elite Extra Edition [$4.99 x 5] - looking for something different than retail and randomly picked up five packs of this draft pick product. 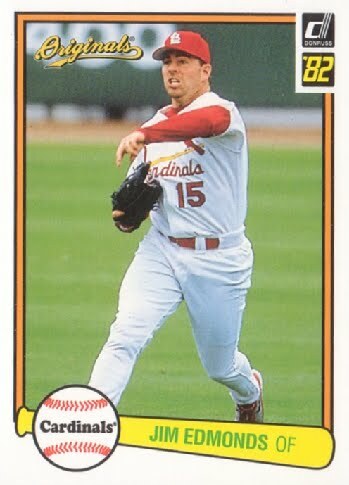 There are 'traditional collectors' who only touch MLB/MLBPA licensed cards and turn their noses at draft pick and/or prospect cards - draft pick and/or prospect cards don't bother me, because it is a nice novelty to be able to pull the most basic [as in non parallel, non-autograph] cards of relative unknown drafted players and see if they develop into a professional who is going to reach the Major Leagues one day. 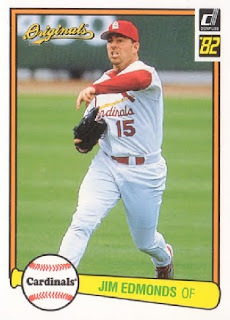 I'm bummed as anyone else, when I end up holding draft pick / prospect cards of players who don't reach the Major Leagues - but it is fun to see those who reach the Major Leagues and actually establishes themselves, if I have an 'early card' of theirs. Watching professional players go through the minors and develop in baseball is like watching paint dry - but looking at the backs of these cards, the cards featuring players drafted out of college, should be the ones to look for in the next year or so [either to reach the Major Leagues or to flame out]. With Torii Hunter's comments igniting a firestorm with baseball fans, it maybe good timing to watch a baseball movie like Sugar - it sheds some insight to the systematic development of potential talent from the Dominican Republic and humanizes those brought over to play baseball professionally. Miguel 'Sugar' Santos [played by Algenis Perez Soto] is a diamond in the rough, a talented baseball player who is cocky and has some rough edges to polish - as he plays in a baseball academy [ran by the fictional Kansas City Knights] in the Dominican Republic. Most importantly, Santos possesses an electric arm with promise to do some things as a pitcher - particularly after Santos learns to throw a 'spiked curve,' from an visiting official from the parent organization. Santos is eventually shipped off to America with a fellow player and friend from the academy, takes part in spring training - Santos shows enough promise to skip rookie ball and is assigned to the Knights' Single-A minor league team in Iowa. However, Sugar treats professional baseball as the key to Santos' future success - but at the same time, as the Santos' minor league season wears on, the game begins to unravel for him when he gets hurt and struggles to come back. He then loses his two best friends on the team through a release and through a promotion. Sugar paints Santos as complicated, brooding, angry, disillusioned and desperate - the contrast between Santos' early promise and his frustrations seems a little unnerving for those expecting a straight shot to the top for Santos. The movie lingers towards the alienation Santos feels - especially when things don't go his way, when he can't be part of the action and when he has to adjust to a different culture. Santos may is barely hanging on. He isn't merely stereotypical of the jock, longing to play again however and aloof to those around he - at his host family's home, he helps fix a broken drawer and helps wash dishes. Santos experiences success and failure as a baseball player, but there is realization as far as Santos goes, his time in the game is fleeting - he suddenly finds himself barely hanging on and maybe so are his aspirations. Fed up, Santos takes a drastic step that seems entirely foreign to the popular baseball/sports movie - still anticipating something as dramatic as getting Santos back on the mound, a glimpse of Yankee Stadium is as close we get, as close as Santos gets. Still, the audience comes away with the idea, Santos is a better man as he comes of age - he seems happier, he has adjusted, even though his promise as a professional baseball player is up in the air. 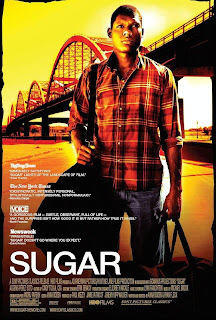 This one of those movies that maybe a one-shot deal, this isn't going to be a franchise, the actors may never appear in a mainstream film again - but Sugar is a baseball movie that becomes something else, maybe a coming of age movie serving notice for anyone aspiring to chase their American dream. Chone Figgins and Ichiro look to gel during spring training and form a top of the lineup duo, to ignite the Seattle Mariners - on paper, the Seattle Mariners look to be at the top of the American League West. However, I don't think they are a finished product and wouldn't be surprised if they took a step back, before they can take a step forward. Can the starting pitching hold up after Felix Hernandez and Cliff Lee - will the offense be able to score enough runs? Will Milton Bradley put together a relatively healthy and productive season? Ichiro is some kind of freak, but does his 'homeboy,' Ken Griffey Jr. have one more season - where his bat speed resembles something more of what fans saw in the late 1990s or even when healthy in the 2000s. In putting together a revamped Mariners team, GM Jack Zduriencik has had a cult-like following among mainstream baseball pundits and statheads alike - but is Zduriencik's 2010 Mariners good enough to compete against the Angels? I'm an Angels fan and it is going to be exciting to see how the two squads battle it out in 2010 - since they should be the top teams to battle for the division title. 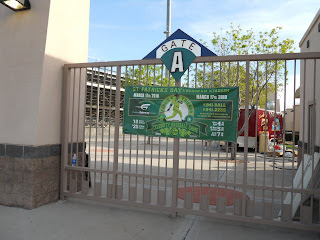 This post is about several pictures I took at a Chicago Cubs / Arizona Diamondbacks spring training game - including a banner advertising an event held by baseball Hall of Famer Ferguson Jenkins, who has a table set-up at HoHoKam Park [with some other retired players making appearances like Lee Smith, Bob Dernier, HOF Rollie Fingers, etc] to sell autographed items and to sign autographs as well [for a small fee]. An unknown Cubs player heading to the locker room after pre-game BP signing autographs for fans - access to get autographs from Manager Lou Piniella and the better players [think Alfonso Soriano, Carlos Zambrano, Aramis Ramirez, maybe Derrek Lee] on the Cubs is often times hit-and-miss, because of the reluctance of those high-paid players to show appreciation for the team's strong fanbase. Among established veteran players - be happy if Ted Lilly and Carlos Silva relent to sign an autograph. Ryan Dempster is typically pretty good about signing too. Here is a banner with a Web site address to support an initiative to add surcharge on spring training tickets sold - so the Chicago Cubs can get a new ballpark in Arizona. Shortstop Starlin Castro, the crown jewel of the Chicago Cubs' farm system finishes his day on the field, running in-between innings - I'm pretty sure it is him. Chicago Cubs pregame warm-up before the game - maybe unlike other Cactus League ballparks, there are people everywhere at HoHoKam and while it isn't like the real deal back at Wrigley Field in Chicago, going to a Cubs game in spring training is kind of an event in itself. Brett Anderson throws in a side session during an Oakland Athletics workout at their facility at Papago Park - so far he pretty much signs anything put in his face. The Angels will always be my team but visiting the Oakland Athletics camp once or twice in spring training - seems like a spring training 'must-go' destination in order to get handfuls of autographs, even though their 'stars' may pale in comparison to more popular teams training in the Cactus League. I'm not sure if the change is permanent, but during my last week in Arizona, I'd read in the local paper, the A's moved their Major League team workouts to their spring training stadium [Phoenix Municipal Stadium] - because it was easier for the players and staff to work from the stadium, than at their facility at Papago Park. Trevor Cahill [pictured signing] and Anderson are relatively young players on the A's, who maybe the future pitching aces for the franchises - at this point, they are very accomodating signers. I think Justin Duchscherer [obscured by his cap and the sea of people] said he likes to sign because one day - people won't be asking for his autograph anymore. During my trip to the Cactus League, my friend and I visited the Angels' camp in Tempe - after he was done with his Japanese media obligations new Angels' slugger Hideki Matsui relented to sign for fans waiting at the rail at Tempe Diablo Stadium. I was the second to get Matsui's autograph that day [my friend was the first] - but we had to get out of the way fast, because as Matsui signed 25-30 autographs, he was mobbed by fans and collectors waiting on him. This wasn't as bad as when Ichiro signed over at Peoria, but it was still a mess trying to get Godzilla. Trying to get the all-stars in a supposed relaxed setting like spring training is like trying to jump into a mosh pit during a rock concert - the mass of humanity is unforgiving at times, but it seems all worth it, when coming away with an autograph. I got Aroldis Chapman's autograph on an odd-sized image photo print [a little smaller than an 8x10] during a game between the Cincinnati Reds and the Cleveland Indians - he signed by the camera well near third base and looked to have stopped once the National Anthem was being sung. After, I made my way towards were he was lingering and called out to him with others who wanted his autograph - he signed several more before finally walking away. My very fortunate friend also got Chapman's autograph, but towards at the end of the day, when I spotted Chapman in street clothes at the Reds' development complex - Chapman was waiting to be picked up and when his ride arrived, he was swarmed by five or six people and signed maybe two or three as someone from the player development complex came out and was trying to usher Chapman away. Reds Manager Dusty Baker, as well as several other aspiring players in the Reds organization - stopped in their vehicles to sign for those still waiting for autographs as they were leaving for the day, including Yonder Alonso, Drew Stubbs, Chris Valaika, Mike Leake, Philippe-Alexandre Valiquette and Travis Wood. Being able to get out to Arizona for an 11 day spring training trip from the end of February through the beginning of March - made me feel enthused about the upcoming MLB season. The worst part of the off-season is stockpiling baseball cards and other stuff and having no place to go to get them signed. Once the autograph numbers piled up and I start to see other people chasing after players, I start to feel like I have a purpose again - even though I may not have gone to Arizona as a big league player or an employee of an MLB team. My total number of autograph was around 441 - which seemed like a lower number than I'd expected to get. When I start to feel like opportunities to get a particular player are shrinking - then it is disappointing. It isn't realistic to expect to get everyone, but it gnaws at me, on the way back home with my friend. The weather in 2010 in Arizona wasn't as hot - I was glad that going there and coming back, the travel days to get from California to Arizona were more bearable. While it did rain at least one day on the trip, going out for autographs - unlike 2009, it wasn't I felt like I was imploding every day I went out for autographs, because of the heat. With my 'dinky,' but new point-and-shoot camera, I was able to take some images - here is one of Ken Griffey Jr.
"Hey, [Junior] - when are you going to sign?" A fan yelled during a Seattle Mariners / San Diego Padres spring training fan fest in Peoria. "Tomorrow morning," Junior shot back. "[Catch me] at the Holiday Inn."